Google Chrome has started testing a dark mode for Android and Mac devices. Google has implemented the anticipated change in the Canary channel of the Chrome browser for machines running macOS Mojave. Similarly, Chrome 73 has reached the beta channel for Android devices with an early dark mode implementation. Separately, the Chrome 73 release for Windows, macOS, and Chrome OS is found to enable support for multimedia keys. This will let you control audio or video playback on the Chrome browser directly using the hardware media keys on your keyboard. Linux systems are also believed to get similar treatment at a later stage. 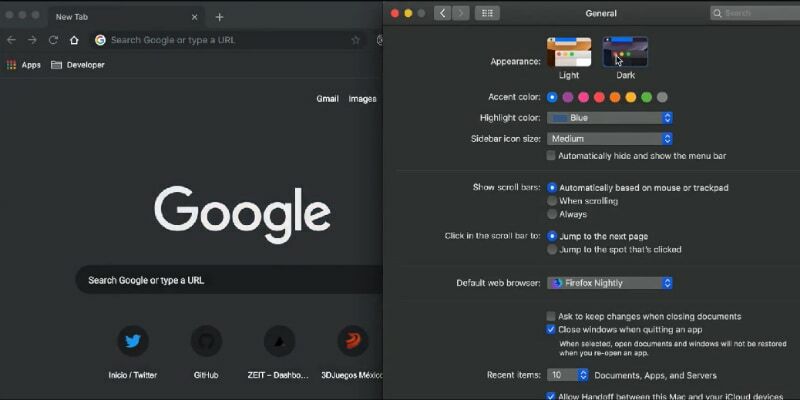 Among other developments, the Google Chrome Canary 70 release for Mac machines is found to work in line with the system-wide dark mode of macOS Mojave. This means you’ll now be able to comfortably use Chrome browser on your MacBook or iMac even in dark. As first spotted by Twitter user @markdrew53, the latest Chrome Canary version doesn’t require any additional tweaks or changes in its settings to enable the dark mode. The browser simply uses transforms the experience once you’ve enabled the system-wide dark mode on your Mac machine. This appears similar to how the Chrome browser in its Canary channel has recently started supporting dark mode on Windows PCs. Of course, a large number of Windows 10 users urged Google to bring dark mode support in the past, including Senior Chrome Engineer Peter Kasting. Since Google is initially testing the feature, you may find some lag at the current stage. However, as Scott Scrivens of AndroidPolice points out, you can enhance the dark mode experience by switching on some flags on the new Chrome Canary version. It is safe to expect that the stable Chrome release will fix the initial bugs and give a perfect dark mode experience on Mac devices. Meanwhile, instances of dark mode support for Android has also been noticed through the latest Chrome 73 beta build. It essentially comes to force once you’ve switched the Night mode on your Android Pie device to Always on after going into the Developer options. The experience is initially limited as the dark mode is only applicable to pop-up menus, while the address bar still appears in white colour, as reported by 9to5Google. Nevertheless, the stable Chrome 73 for Android may get a full-fledged dark mode. The Chrome 73 beta for Android also includes a new download manager as well as an upgraded downloading experience. There is a snackbar that shows an animating loading indicator which slides up from the bottom. The Downloads page itself has also received a facelift and is now showing full-width images with rounded edges. Dedicated tabs to move from the downloaded images to videos and other content are also available at the top of the screen. The omnibar in the latest Chrome beta version for Android devices shows a quick shortcut that lets you share the Web address with a single tap or edit the previously visited URL by hitting the pen icon available next to it before tapping the enter key. You can experience the changes by downloading the new Chrome beta from Google Play. Chrome 73 is also reaching Windows, macOS, and Chrome OS next month, with support for multimedia keys. This new change will let you use the play/ pause key or volume buttons on your keyboard to control the video playback on your desktop. ZDNet reports that support for multimedia keys will work at the Chrome level — not the tab level. This means that you’d be able to control the media content from your keyboard even when the Chrome browser is minimised and running in the background. The feature is initially available through Chrome 73 beta and Chrome Canary distributions, and it will reach Linux systems at a later stage. The official changelog of the Chrome 73 beta release shows that there is also a Media Session API to enable developers with a way to control the media playback experience and customise interactions for multimedia keys. Further, as 9to5Google notes, there is a dedicated Sync and Google services section that comes as a unified page to list all options related to the data collected by Google through Chrome. There is also an Auto Picture-in-Picture (PiP) mode for Progressive Web Apps (PWAs) on your desktop. The feature, which is currently in testing for developers, is designed to open PWAs in the PiP mode. Google has also provided features such as “Enhanced Spell Check” and “Safe browsing extended reporting” when Chrome Sync is enabled. The browser also has the ability to collect anonymised URLs through the Make searches and browsing better option. A Badging API is also a part of Chrome 73 that could help users with notification badges and indicators on their home screens. Also, a “Skip Ad” button is being tested for the video window on services such as YouTube.